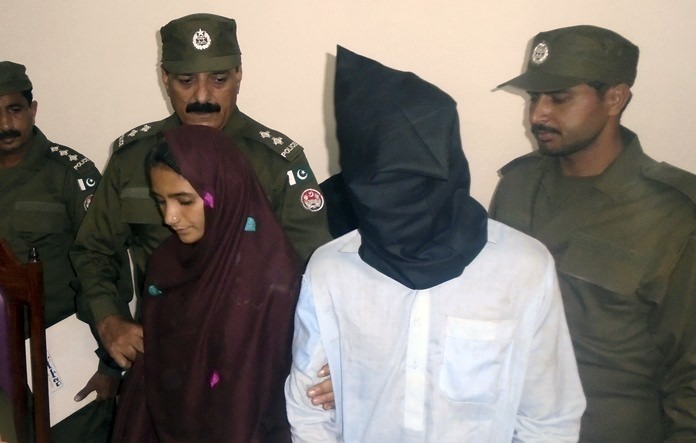 Multan, Pakistan (AP) — Pakistani police arrested a newly married woman on murder charges after she allegedly poisoned her husband’s milk and it inadvertently killed 17 other people in a remote village, a senior police officer said Wednesday. District police chief Sohail Habib Tajak said a judge allowed the police to question the woman, 21-year-old Aasia Bibi, for a week to determine whether it was the woman’s decision or her boyfriend had incited her to kill her husband by poisoning. “This incident was complicated and challenging for us but our officers have made progress by arresting a woman and her lover in connection with this murder case,” Tajak told The Associated Press. He said Bibi was married against her will in September in a village near the town of Ali Pur, 100 kilometers (60 miles) south of Multan, a city in the eastern Punjab province. Tajak said Bibi was not happy with her husband and wanted to return to her parents’ home. She apparently obtained a poisonous substance from her boyfriend, Shahid Lashari and mixed it in milk for her husband, who refused to drink it, Tajak also said. The woman’s mother-in-law later inadvertently used the tainted milk to make a traditional yogurt-based drink and served it to 27 members of her extended family, who fell unconscious and were hospitalized. Seventeen people died and 10 are still being treated in hospital, he said. Bibi and Lashari appeared before a judge in the city of Muzaffargarh on Tuesday, where she told reporters that she was angered over her parents’ decision to marry her to a man against her will. They did not have lawyers. “I repeatedly asked my parents not to marry me against my will as my religion, Islam, also allows me to choose the man of my choice for marriage but my parents rejected all of my pleas and they married me to a relative,” she said. Also Wednesday, in the eastern city of Lahore, a brother shot and killed his sister who had recently wedded a man of her choice without consent from her family in the latest case of so-called honor killings. Police officer Shaikh Hammad said Mahwish Arif, 25, was fatally shot by her younger brother Samar Ali. The brother fired three bullets as Arif came to visit her parental home, months after the marriage, in the suburban area of Satu Katla. Hammad said Ali fled the scene after killing his sister. A police search was under way. Nearly 1,000 Pakistani women are killed by close relatives each year in honor killings.